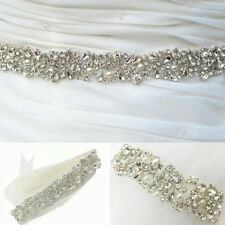 Exquisite & high quality Bridal sash. Belt Color: Light Cream. Total Length of ribbon belt is 118.11“(3m). If you are not happy, we are not happy! Also note that monitor settings may vary from computer to computer and may distort actual colors. Features: 100% brand new and high quality A set of 1pcs Elegant Handmade Bridal Belt Ideal for casual, household, party, birthday, etc. 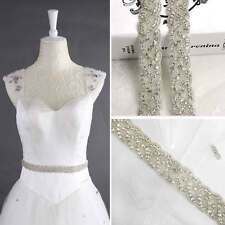 Type:Bridal Belt Color:ivory-white Rhinestones part: length: approx 45 cm;Width: approx 2.5 cm Ribbon part : Length: approx 275cm Material:Rhinestones Satin Ribbon Pearl Note: Please allow 1-3cm (0.4-1. Crystal Piece (LxW) 12.6"x1.2" / 32x3cm. Total length is 106.3" / 270cm. This beautiful bridal gown cover is 180 80 22cm. 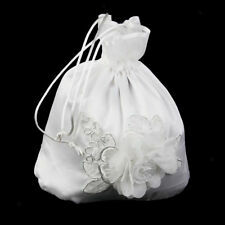 - Ideal carry cover to safely transport your dress and minimize creasing. It is good protection for use when traveling with your dress and for safe storage. Width of the Ivory Sash is 1.06" / 2.7cm (27mm). Materials: Clear Rhinestone, Silver Claws, Faux Pearl, Rhinestone Applique, Crystal Applique. 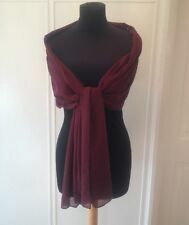 Can be tied in a bow in the back of the gown or altered to your gown to be worn as a bridal belt. Made with crystal rhinestones on soft double sided satin, angle cut and sealed at the ends to prevent fraying. 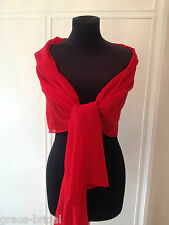 Can be tied in a bow in the back of the gown or altered to your gown to be worn as a bridal belt. Not only as a decoration to make a bright spot for a wedding or evening dress, but also can help liven up your outfit. Perfect for brides,bridal parties,and any other formal occasion. You\'ll become the center of attention and everyone witnesses the most beautiful moments of your life. Material Cuprum;ABS plastic; Brass Color As picture shown Overall Size 2cm x 275cm Rhinestone Size 2.5cm x 45cm Designer/Brand Unbranded Brand Unbranded/Generic MPN HD786862880072 EAN 0786862879960. Width of the ribbon is 0.79" / 2cm (20mm). Ribbon Color: light Ivory. If you are not happy, we are not happy! Also note that monitor settings may vary from computer to computer and may distort actual colors. A genuine sixpence that has been in circulation and has been polished dated between 1947 - 1967. 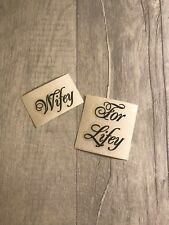 A lovely gift for a bride to be:-. Bridal Charm Pin. The charm pin can be attached to brides bouquet, garter or bridal bag. New Rhinestone Applique. Main Material: rhinestone. Colour: silver. The real colour of the item may be slightly different from the pictures shown on website caused by many factors such as brightness of your monitor and light brightness. 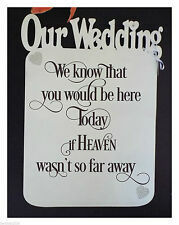 Made with crystal rhinestones on soft double sided satin, angle cut and sealed at the ends to prevent fraying. 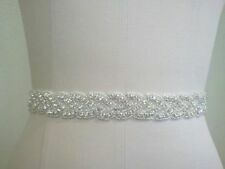 Can be tied in a bow in the back of the gown or altered to your gown to be worn as a bridal belt. Not only as a decoration to make a bright spot for a wedding or evening dress, but also can help liven up your outfit. Perfect for brides,bridal parties,and any other formal occasion. You\'ll become the center of attention and everyone witnesses the most beautiful moments of your life. Material Cuprum;ABS plastic; Brass Color As picture shown Overall Size 2cm x 275cm Rhinestone Size 2.5cm x 45cm Designer/Brand Unbranded Brand Unbranded/Generic MPN HD786862880072 EAN 0786862882885.